There are at least two good reasons why Zatoichi shouldn’t be a samurai. First, he’s too well-fed. His chubby, innocent face beams from over a stocky body, making him seem too unathletic and too darned nice to be a master swordsman. And second, he’s blind. Unbeknownst to Americans, Zatoichi (or “Blind Ichi”) was a cultural phenomenon bigger than James Bond. With 26 films (Bond is at just over 20 so far) and 100 TV episodes, this blind swordsman was one of the most popular heroes in Japan. We are introduced to Ichi in a Japanese village, where some men are playing dice. Ichi (Shintaro Katsu) joins the game and sets a trap. He lets them take advantage of him on one throw of the dice, then he turns the tables on them. He not only wins their money, but forces them to admit they cheated in the first round. But cheating cheaters isn’t his greatest trick. His real talent is swordsmanship. His first movie plays like Yojimbo, which also came out in the early 1960s. Both films feature a wandering swordsman hiring on as a mercenary in a town with two feuding bosses. The rival boss has hired on a samurai to counterbalance the talents of Ichi. In the days leading up to the inevitable battle, Ichi and the samurai become friends. They are the only two people in town without loyalty, but ironically, they are the only two with honor. It appears that they may not have to fight each other after all, but that all changes when one boss threatens to use a rifle as a substitute for the samurai. Ichi may have become a sort of Robin Hood, but in his first film he is morally ambiguous at best. In the opening scene he’s guilty of entrapment. Just because he’s better than the backstabbing townspeople doesn’t make him a saint. He freely admits that he’s a “lowly gangster,” and indeed he is. Ichi’s second film is more interesting than the first. The plot is more concise and Katsu has settled into his character. He returns to the same town, one year later, to pay his respects to the samurai he killed in the first film. He makes his way there as a traveling masseuse. His last client is a lord from Edo who, it turns out, is retarded. The lord’s mental condition is a state secret, and three samurai are sent to kill Ichi for what he knows. He handles all three of them easily, and the rest of the movie sees Ichi on the run from larger and larger gangs of samurai sent to dispatch him. They even set up a 20-man ambush for him that Ichi... well, you’ll just have to see it yourself. The first two Zatoichi movies are not better than the Mifune/Kurosawa samurai pictures or the Samurai trilogy. They have some slow scenes and bad dialogue that keep them from becoming timeless classics. But they are often fun, and that’s enough. Americans think of Bruce Lee, Jackie Chan, and Jet Li when they think of Asian martial arts. We watch them for their displays of grace and for the elaborate, long, choreographed fight scenes. In contrast, the fight scenes in Zatoichi, indeed in most samurai films, are short and quick. A fast fight might be over in a matter of seconds — crack, crack, crack, and three men fall. A longer fight might go on for a minute, but it’s still a quick series of slashes and thrusts followed by long periods of pacing and stalking. 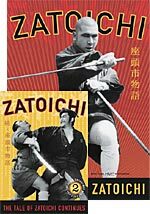 The point is that fans of Kung Fu movies won’t necessarily like samurai movies, although if you’ve exhausted Bruce Lee and Jackie Chan, maybe you should give Zatoichi a try. Home Vision has no doubt faithfully restored and transferred these films to video, but there are many problems with the image, particularly in the first film. For one thing, the framing is such that the tops of the actors heads are always getting clipped at the top. In the final climactic scene, Ichi stands up straight and the frame ends at his shoulders. The first film is also unusually dark. I adjusted my TV to make up for it during the first viewing. On second viewing, it’s clear the film was intentionally shot that way, usually to suggest night. Nevertheless, it’s disconcerting to see anything less than pristine picture when watching a DVD from a reputable producer. These problems are gone from the second film. It may have something to do with the fact that different directors and cinematographers worked on the two films. Both films are presented in their original 2.35:1 aspect ratio. Both feature monaural audio tracks and optional English subtitles. The mere fact of their existence is almost as interesting as the movies themselves. While American subcultures watched the birth of Marvel superheroes in the 1960s, Japan had its own heroic revolution. Each of the two discs features its own essay in the liner notes from Tatsu Aoki, an avowed “Ichi Freak,” who explains the cultural phenomenon. He mentions that Zatoichi became more than just a film or TV phenom, but also a figure in comic books and trading cards. And so, as a special treat, both DVDs include a sheet of four different trading cards with still pictures from the movies on the front and a description of Ichi on the back. I get the feeling that, having seen two Zatoichi movies, I’ve seen them all. And yet, as with any great adventure series, there is some fun in seeing our heroes again and again. After all, we Westerners buy tickets every two years to see James Bond. Why not a blind swordsman as well?